Melrose Hostel is the newest up and coming hostel in Los Angeles. 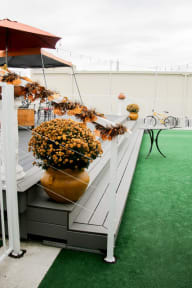 This hostel is founded on the idea of creating a homely- and budget-friendly luxury hostel where travelers just like you can experience Los Angeles with top notch comfort, safety, and cleanliness. Although we are a newly created hostel, our guests are already raving about our delicious and free breakfast, attentive and friendly staff members, comfortable and clean beds, as well as an amazing rooftop patio and view! 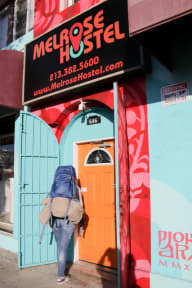 Melrose Hostel is located in the geographic center of Los Angeles and is near many different attractions such as Thai Town, Koreatown, Downtown Los Angeles, Hollywood, Griffith Observatory, The Grove, Universal Studios, and more! By bus, Melrose Hostel is located 5 minutes from the Hollywood/Western Metro Station (Red Line) and 10 minutes from the Wilshire/Western Metro Station (Purple Line) as well as many other Metro Bus lines which are reachable from right outside our hostel! Feel free to ask any of our staff members for directions or help on planning out your next adventure! Non-Refundable Cancellation Policy: All changes, cancellations, and requests to the reservation must be made 24 hours prior to the check-in date/time (3pm local time daily). Any cancellation within 24 hours of check-in time will result in cancellation fee of the first night's stay. Deposits are non-refundable (unless the Standard Flexible Booking option is available and you choose to select it). Arrivals and Departures - Check-in time is from 3:00 p.m. to 11 p.m. daily. Check-out time is at 11 a.m. daily. Please contact the hostel if you will be arriving after 11 p.m. so we may provide you the procedures to enter the hostel and to find your accommodation! Failure of checking in by 11 p.m or contacting the hostel of your late arrival will result in an automatic cancellation of your reservation. Payment is due upon arrival by cash or debit/credit card. We accept Visa, Mastercard, Discover, and Amex. All guests must show matching valid I.D. to their debit/credit card used during booking at the time of payment and/or arrival. All payment must be received in full upon arrival, failure to pay the reservation will result in cancelation of your reservation and this event may affect your future stay at our hostel. All guests must be a non-local traveler or a backpacker and must provide with a proof of onward travel upon arrival, no extensions will be granted without a travel itinerary. Maximum Length of Stay at our hostel is 14 nights/calendar year. Please do not extend if your current stay is past 14 nights, the deposit will be non-refundable unlaess the Standard Flexible Booking option is available and you select it. Taxes are not included - 14.00% Transient Occupancy Tax will be added. All guests must provide Valid Photo Identification outside of Los Angeles radius (Government issued I.D outside of Los Angeles, such as Passport, State Issued Driver License, etc.). All Bookings must be made under the same name as the person staying and match the credit card name. All Guests must be 18+ to stay at Melrose Hostel. The Hostel is very good. The room is very big with 16 beds. Staff are very kind. Their breakfast is great with a lot of fruit, such as watermelon,my favorite. Located near Koreatown, with metro bus stop just across the street. Free breakfast, but using disposables. Comfortable common area with Netflix. Friendly and helpful staff. Reminded that you need to walk up a little bit of stairs to the hostel. They almost have a balcony.